It's time for this month's Secret Recipe Club! The Secret Recipe Club is a group of food bloggers who secretly make one of someone else's dishes and post them all on the same day at the same time. It's really fun, choosing a recipe to make, making the recipe, then reading about everyone else's recipes. It's a great way to "meet" other bloggers and check out some great blogs that you never knew about before. This month I was assigned the awesome blog Inquiring Chef, written by Jess. Jess is an American who has been living in and loving Bangkok for the past four years. She is also a new mommy! She gave birth to twin baby girls just a little over a month ago. Congrats Jess! They are beautiful! 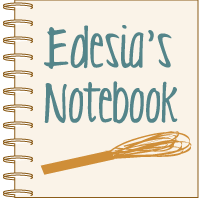 I found so many recipes on Jess's blog that I marked to try. I pinned her Chicken Marbella, which she lovingly calls "wedding chicken" because it's what was served at her wedding, her Quinoa and Goat Cheese Stuffed Tomatoes, her Slow Cooker Mango Sriracha Pulled Chicken, and I can't wait to try her Twice Baked Butternut Squash with Quinoa, Pecans, and Parmesan when fall rolls around. Yummy! I found so many yummy things on Jess's blog that I couldn't narrow it down to just one. I made two of her recipes this month and they were both awesome. One definitely took the cake though, so that's the one I'm sharing with you today. 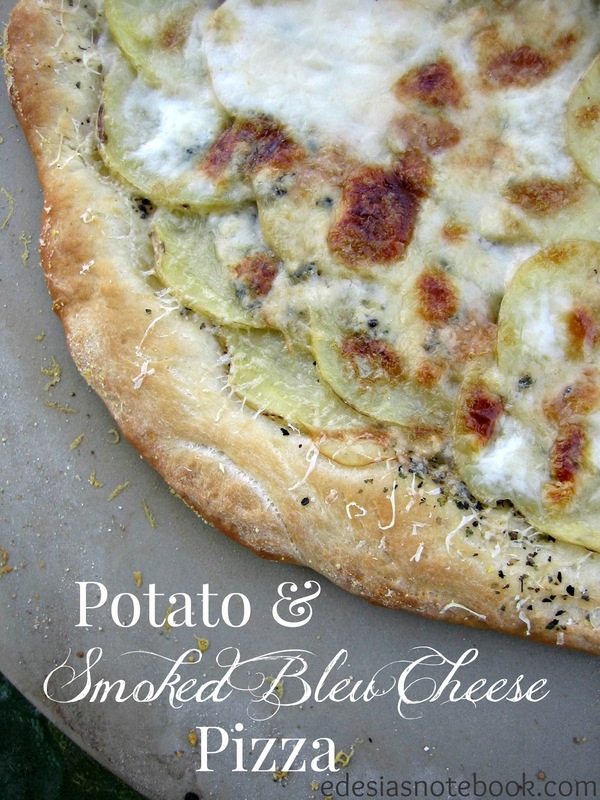 Her Potato and Bleu Cheese Pizza caught my eye and then I couldn't get the thought out of my head. It was so awesome I made it twice in one week! The first time I made it, it was so dark and stormy that I couldn't get a decent picture to save my life. But I was happy that I had an excuse to make it again! 1 large yellow potato, about 6-8 oz. Preheat oven to 425°. Spread cornmeal on a stoneware baking sheet. Press pizza dough out on baking sheet, about 11” across. Brush dough with olive oil and sprinkle with marjoram. Slice potatoes very thinly using a mandolin. Arrange potato slices on prepared pizza dough, overlapping them slightly. Top with bleu cheese crumbles and bake for 8-10 minutes or until bleu cheese has melted. Drizzle the cream or half and half on the pizza and top with the freshly grated Parmesan. Return to oven and bake another 8-10 minutes or until crust and cheese are golden brown. Cut into 6 slices. Makes 3 servings, 2 slices each. Oh my gosh, this pizza is amazing! You would not believe how good it smells while it's baking. Unbelievable. The smoked bleu cheese is definitely the star of this pizza, but the way the all the flavors and textures combine is what makes it amazing. The crispy chewiness of the crust, the soft bite of the potato, the sharp tang of the blue cheese and the way the cream and Parmesan get all browned on top make it just heavenly. I made this as our meatless meal last week, paired with a spinach salad. I wasn't sure if my daughters would like it, so I made them a smaller simple cheese and tomato sauce pizza. They ate that and then my six-year-old, Lena, asked to try this one. She loved it and ate a whole piece of this one as well. I only made a few minor modifications to Jess's recipe. I used my tried-and-true dough recipe, which is actually very similar to Jess's. I lopped off about a third of it and used that for my kids' pizza and used the rest to make an 11" potato pizza. The recipe is easily adapted for bigger or smaller pizzas. I also used a smoked bleu cheese instead of regular. It would be just as great with regular bleu cheese, but I loved the smoked flavor of it. I had used smoked bleu cheese before, in my Smoky Steakhouse Grilled Cheese Sandwich, so I knew how amazing it was. I just happened to pick this stuff up a few days before making this pizza. So good. Cheese this expensive is not usually in my grocery budget, but I won a gift card to this specialty Italian grocery store at a Taste of Home Cooking School event last year. Just got around to using it! This was the perfect item to spend it on. I also used dried marjoram instead of fresh rosemary. I really dislike rosemary, so I was perusing my spice cabinet to see what else I could use. I saw a small jar of dried marjoram that I honestly don't even remember buying. I know I had not used it before as the paper strip on the Penzey's jar was still intact. I smelled it and thought it would pair nicely with the bleu cheese. It was perfect. Thyme would also work well, I think. This pizza just blew me away. My husband raved about it too. And it was really super simple to make, which is important on pizza night! Oh, the other recipe I made from Jess' blog was her Thai Salmon Satay. It was really good, but I managed to burn a lot of it because I walked away from the grill for too long. Oops! The pieces of it that I was able to salvage were great though. I am so glad I was assigned to Jess's blog this month. I definitely have a new favorite pizza! Thanks for a great recipe, Jess! what a unique pizza :) yum- great choice. That looks amazing! LOVE the potato-bleu cheese combo. Thanks for sharing with the SRC. Potatoes and bleu cheese on pizza? I never would have thought of that, but now I really must try it. That sounds amazing!